29 years, 8 months, 13 days old age. Shahbaz Nadeem will turn 30 on 12 August, 2019. Only 3 months, 17 days, 22 hours, 1 minutes has left for his next birthday. Shahbaz Nadeem has celebrated the total number of 29 birthdays till date. See the analysis by days count and bar graph. Shahbaz Nadeem was born on 12-08-1989, in the Muzaffarpur district of Bihar. He is an Indian slow left-arm orthodox bowler. 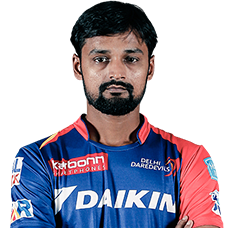 He has played for Bihar Under 14 team and Indian U-19 side and currently plays for the state of Jharkhand at domestic level and IPL franchise Delhi Daredevils. A left-arm spinner with a classical action, Shahbaz Nadeem hails from the Steel City of Bokaro. Unlike most modern-day spinners, Nadeem isn’t afraid to toss the ball up and bait the batsmen. The left-arm spinner, whose dream was to become a fast bowler like his childhood idol Wasim Akram. He made his career’s first-class debut in 2004 and starred in the 2012-13 Ranji Trophy with 42 wickets at an average of 25.97 in nine matches. He extended his domestic form into the 2013 IPL, taking nine wickets in 12 matches for Delhi Daredevils at a sub-six economy. He has been consistently putting up impressive performances in the domestic circuit as well and leads Jharkhand in the absence of Varun Aaron. He finished as the highest wicket-taker with 51 scalps in the 2015-16 season of the Ranji Trophy. He was with Delhi Capitals for 6 consecutive seasons. He then was shifted to SRH from 2019 season. He was born to Javed Husn Ara Mahmood. He shifted from Bihar to Jharkhand after playing age level cricket for Bihar. He has also represented India at the U-19 World Cup. Besides bowling left-arm orthodox, he can also bat a bit.